Northern Ireland athletes Amy Foster and Stephen Scullion both achieved European Indoor Championship standards on Saturday. City of Lisburn athlete Foster clocked a personal best of 7.33 seconds in the 60m heats at the Irish Championships in Athlone. Foster's time is .03secs inside the standard for the Gothenburg event. Scullion, meanwhile, ducked under the 3,000m qualifying time of 8:00.00 with a 7:58.11 clocking in Birmingham. The Northern Ireland man's performance cut 12 seconds off his previous personal best for the distance as he finished seventh in a race won by double Olympic champion Mo Farah (7.:42.00). 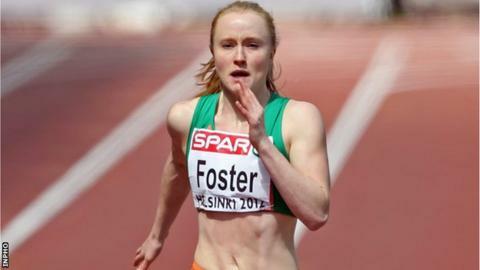 Foster looks certain to be selected for the European Indoors Championships as she is comfortably the Irish number one this season. Scullion's place in Sweden may not be totally secured as he is currently only the third fastest in this season's Irish rankings. Waterford man David McCarthy clocked an impressive 7:51.24 when winning in Boston on Friday night while Ciaran O'Lionaird has also posted 7:53.69 for the distance this season. However, O'Lionaird is likely to run the 1500m in Gothenburg if he does opt to compete at the Championships. Other Irish athletes are also close to achieving the 3000m qualifying time and they have until next weekend to better the Gothenburg mark. Corkman O'Lionaird again showed that he is over the effects of last year's injury-plagued season as he clocked a personal best of 3:52.10 when taking third behind Lopez Lomong (3:51.21) and Matthew Centrowitz (3:52.34) at the Millrose Games in New York on Saturday evening. On the opening day of action at the Irish Indoor Championships in Athlone, Paul McKee and Jason Harvey were among the qualifiers for Sunday's 400m final. McKee, a world indoor bronze medallist over the distance in 2003, clocked 48.87 to finish just behind heat winner and fastest qualifier Timmy Crowe (48.71). Beechmount Harrier McKee, 35, is now coaching a number of athletes which includes Harvey. Harvey competed in the 400m hurdles at last year's European Outdoor Championships in Helsinki and will race his coach in Sunday's Irish final after winning his heat in 49.91. With Brian Gregan opting to run the 200m in Athlone and Brian Murphy also not in the field, northerners McKee and Harvey look set to battle for the medals with Crowe and another heat winner Joe Dowling (48.88). Dean Adams came safely through the opening 60m heats with a 7.05 clocking while Ben Reynolds (7.08) also progressed to Sunday's semi-finals. Reynolds qualified for the 60m hurdles at last year's World Indoor Championships but he has been bothered by injury over the last nine months. Ballymena & Antrim athlete Christine McMahon came into the championships as favourite to defend her 400m title but she pulled out of the event with an apparent injury after clocking 57.42 to finish second in her heat. With Kerry Harty not racing, European Cross Country team gold medallist Lizzie Lee won the women's 3,000m title with a 9:45.63 clocking, which left her almost three seconds ahead of Anne Marie McGlynn (formerly Larkin). Letterkenny athletes Mark English and Darren McBrearty both safely qualified for the 800m final where North Down athlete Mark Patterson will also be involved. Of the big names in action on day one at the impressive new indoor venue in Athlone, Robert Heffernan won his 15th Irish indoor 5K walk title with a 19:13.04 clocking while Gregan was fastest qualifier for the 200m semi-finals as he posted a time of 21.56. Two of Paul McKee's other athletes Curtis Woods (22.03) and Ben Maze (22.38) also won their 200m heats.